Last week everything but meat and mushrooms seemed to disappear from the farmers market. It's been too cold for the high tunnel greens, and even the apples and pears are dwindling. 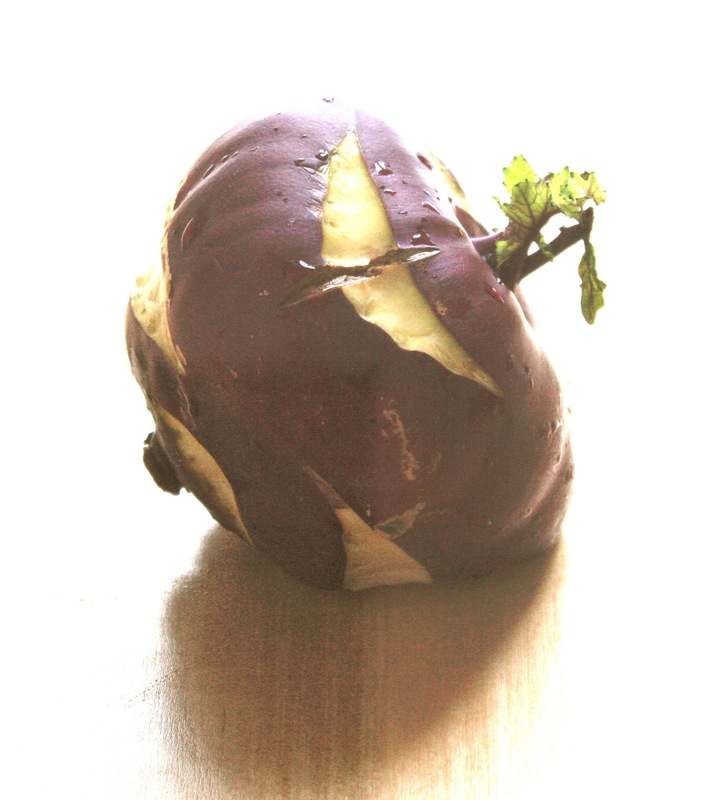 But there are two vegetables that endure: kohlrabi and celeriac. This winter we tried both. Let's just say that cerleriac had some unfortunate intestinal consequences and we probably won't go back. Kohlrabi, on the other hand was a wonderful surprise. Though it looks like a root from an alien planet, kohlrabi is really an enlarged stem that tastes like a cross between cabbage and broccoli. Thin skinned, easy to slice, the flavor is nice and subtle and the texture is crisp and fresh. Such a surprise this time of year. We tried it boiled with butter and parmesan cheese but it seemed too mushy and a waste of such a light and airy food. Better to chop it into matchsticks for munching or slice thinly for salad. MASSAGED KALE SALAD: Take a big bunch kale leaves. Slice them thin and add salt and a bit of olive oil. Massage -- yes, massage -- for 3-4 minutes. They'll break down and become soft and kind of slippery. Then make a vinaigrette with olive oil, lemon juice, and honey. Toss with mango chunks and pepitas. We would eat this every night if I had a kale massager! For pictures and detailed instructions, check out the original source on the Food Network website. KALE, SAUSAGE AND BLACK BEAN SOUP: Google kale and sausage and you'll find dozens of recipes on line. I've adapted one I found from theKitchn: Sautee a kielbasa or spicy sausage like chorizo. Drain the sausage and cook several small diced potatoes, onions, and garlic until soft. Add chicken broth and a large bunch of curly kale (sliced thin with stems removed). Simmer and then add 4 c of broth, thyme, bay leaf. Cook until kale is completely wilted. Add a can of drained black beans and sausage. I often add chopped up chicken thighs when I'm sautéing the onions. Today I'm going to add some leftover ham. This is a really versatile soup. Definitely tastes better the second day when I toss some new kale in for texture! Farm share studio celebrates local food and the farmers who make it possible. Here I'll share artwork and tidbits inspired by local food, landscapes and farms.